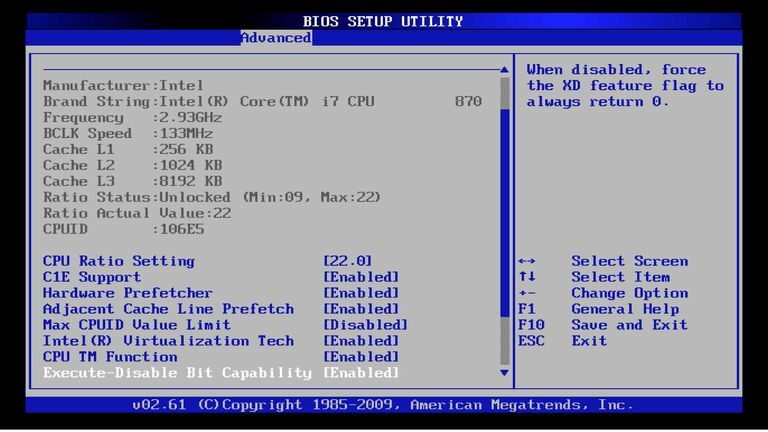 You may need to access the BIOS setup utility for a number of reasons like managing memory settings, configuring a new hard drive, changing the boot order, resetting the BIOS password, etc. Entering BIOS is actually very easy once you determine which key or combination of keys on your keyboard to press to access BIOS. Follow the easy steps below to access the BIOS setup utility on your computer, no matter what's on it—Windows 7, Windows 10, Windows X (okay, I made that up, but you get the idea). Time Required: Accessing the BIOS setup utility for your computer, no matter what kind you have, usually takes less than 5 minutes...probably much less in most cases. Restart your computer, or turn it on if it's already off. Accessing the BIOS is independent of any operating system on your computer because the BIOS is part of your motherboard hardware. I already sort of mentioned this above, but please know that it doesn't matter at all if your PC is running Windows 10, Windows 8, Windows 7, (Windows whatever), Linux, Unix, or no operating system at all—any instructions for entering the BIOS setup utility will be the same. Watch for an "entering setup" message in the first few seconds after turning on your computer. This message varies greatly from computer to computer and also includes the key or keys you need to press to enter BIOS. Quickly press the key or keys instructed by the previous message. You may need to press the BIOS access key several times to enter BIOS. Don't hold the key down or press it too many times or your system may error or lock up. If that happens, just restart and try again. Now that you're in BIOS, you can do whatever it is that brought you to this tutorial. See a Picture Instead of a Message? Your computer may be configured to show your computer's logo instead of important BIOS messages. Press Esc or Tab while the logo is showing to remove it. See the Message but Didn't Catch Which Key to Press? Some computers start too quickly to see the BIOS access message. If this happens, press the Pause/Break key on your keyboard to freeze the screen during startup. Press any key to "unpause" your computer and continue booting. Having Troubles Pausing the Startup Screen? If you're having problems pressing that pause button in time, turn on your computer with your keyboard unplugged. You should receive a keyboard error which will pause the startup process long enough for you to see the keys necessary to enter BIOS! Are You Using a USB Keyboard on an Older Computer? Some PCs with both PS/2 and USB connections are configured to only allow USB input after the POST. This means that if you're using a USB keyboard, it could be impossible to access BIOS. In that case, you'd need to connect an older PS/2 keyboard to your PC to access BIOS.